Many players are often remembered for one game, for one performance but the former player we induct this week into the Hall of Fame is perhaps remembered most for one game simply because he didn’t play in it. And that from the player who has made more league appearances for Burnley than any other, former international goalkeeper Jerry Dawson. The match in question was the 1914 FA Cup Final, won by Burnley and the only time the club has won the competition. Dawson was the goalkeeper but had been injured in the semi-final against Sheffield United, played at Old Trafford. Unfit for the replay he was replaced by his deputy Ronnie Sewell as a goal from captain Tommy Boyle saw us win 1-0 at Goodison Park. Dawson regained his place in the side the week before the final but picked up a rib injury. The town waited with baited breath in hope that Dawson would be fit for the final but the decision was taken away from manager John Haworth when Dawson himself decided he shouldn’t play as he wasn’t certain of completing the match. And so he missed what should have been the greatest day of his life but his selfless decision was rewarded when the Football Association and Burnley Football Club agreed that there should be a specially struck medal for him. Sewell kept a clean sheet and Bert Freeman’s goal won it for us. Dawson got his medal but never got the chance to play in an FA Cup Final again. Despite being born in and living in a village right on the outskirts of the town he had been missed by our talent scouts but was finally spotted playing for Portsmouth Rovers. That is not Portsmouth in Hampshire but Portsmouth on the road from Burnley to Todmorden. It only took a few reserve team appearances before the club realised they had a top goalkeeper on their hands and he was given a professional contract in February 1907 and only a couple of months later, just after his 19th birthday he made his first team debut in a 3-0 home win against Stockport County. After four games of the following, 1907/08 season, he displaced Billy Green in goal and was to be the first team keeper at Turf Moor for many years to come. He was playing in a second division side under the management of Spen Whittaker and his performances were rewarded with a call up for The Football League against The Scottish League with the game played at Ewood Park and the following year he played in the return fixture at Ibrox and received a standing ovation from the crowd after a star performance. Things picked up for Burnley too once Haworth arrived as manager and we won promotion in 1912/13. Although the following season was one of consolidation it was the year of the cup win and despite missing the final he more than played his part. 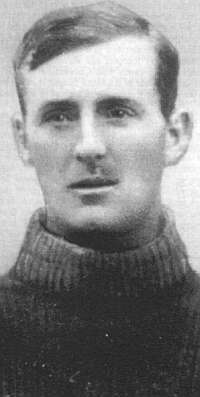 The First World War came and four seasons of league football were lost but Dawson was still in the Burnley goal when we resumed for the 1919/20 season and was now considered to be the best goalkeeper in the country as Burnley became a top side. He missed the Cup Final but was very much involved in the first League Championship won by Burnley. He missed only three games all season and played in all of the 30 games in the undefeated run. Finally in October of the following season he won the full England cap his performances had deserved for some time and lined up for England in Belfast against Ireland. The following April he was in the England side that were beaten at Villa Park by Scotland and it was to be his last cap. The recognition was late in his career, his England debut coming when he was 33 years of age. But his Turf Moor days were far from over and he continued as first team goalkeeper until the end of the 1925/26 season after which he was replaced by George Sommerville a Scot from Glasgow. He remained a player for another three seasons and made an emotional last Turf Moor appearance at the age of 40 on Christmas Day 1928 and not far short of 21 years after his debut. It was against Liverpool and we won 3-2, the day after Sommerville was in goal as we lost the return match 8-1. That wasn’t the end though and he remained as a member of the coaching staff at Burnley whilst also continuing as an accomplished Lancashire League batsman with next door neighbours Burnley Cricket Club. Including war time games he played in well over 700 games for Burnley and his record of 522 league appearances remains to this day very much a Burnley record. He continued to live in Cliviger until his death at the age of 82 in 1970. Jerry Dawson was a Burnley great, there is no doubt about that, and is fully deserving of the honour of being the first player from his era to be inducted into the Hall of Fame.